I often wonder as I watch the myriad of dog walkers, joggers, ramblers and even the chap flying his model aircraft, whether they realise the tracks and paths upon which they walk, run etc were once home to the aircraft of the Royal Air Force and the Fleet Air Arm. 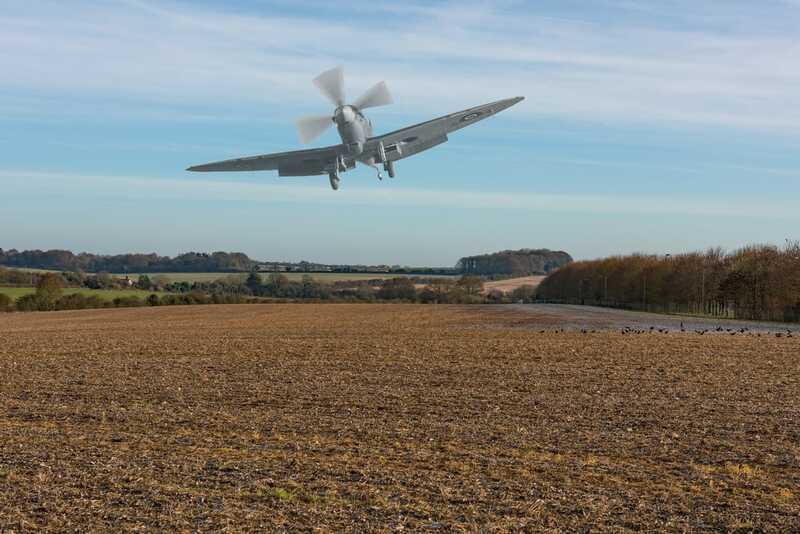 Do the residents of the huge housing estate that is South Wonston ever look out from their windows across the former landing ground and visualise the test flying of Spitfires. Some how I doubt it. I suspect like many others they know not of the fields former history. There is very little at this 480 acre site to suggest that at one time the land was used for aviation. 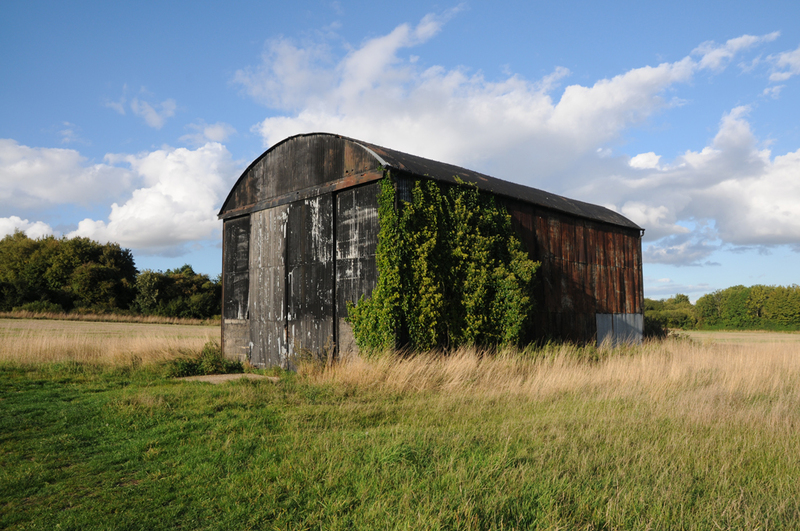 Even the one remaining Dutch Barn Hangar looks like an ordinary agricultural building. However, look a little deeper and the signs are still there, but more of that later. Not many people would be aware that Winchester used to have its own horse racing course. This course was located at a place called Worthy Down. 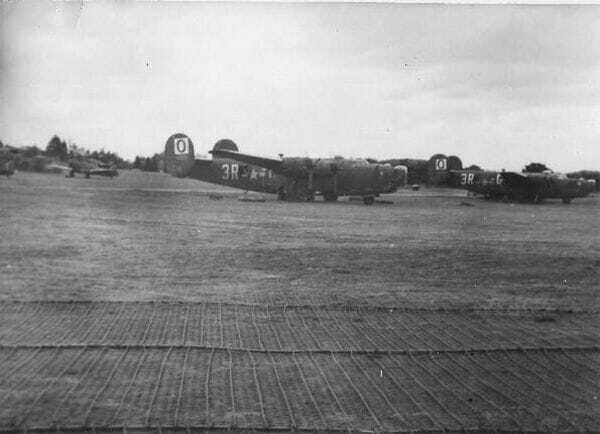 Situated 2.5 miles north of the Wessex Capital in the rolling Hampshire countryside, it was not an obvious place to build an airfield due to the terrain, but in the early days of aviation, aircraft would take off in any direction as long as it was into wind. Worthy Down Airfield was a grass strip built on undulating ground 345’ above sea level, the slopes and type of ground at this field would have made landing and taking off “interesting”. The airfield had a long history and first came into existence in 1917. The former Winchester Racecourse was acquired for use by the Wireless & Observers School (W&OS), who had had to vacate Brooklands due to the expansion of that airfield by aircraft manufacturers. The main technical buildings consisted of six large aeroplane sheds and an Aeroplane Repair and Salvage hangar, this was built close to the Didcot Newbury & Southampton Railway which ran along the airfield's eastern boundary. The accommodation blocks and administration sections were largely complete by the time the airfield opened in 1918. By this time W&OS had moved to Hursley Park, which itself in 1940 became the Control Centre for Spitfire production, following the heavy Luftwaffe raids on Supermarine's manufacturing plant at Woolston near Southampton. In August 1918 the RAF & Army Co-operation School arrived and acted as a finishing school for Corps Recce pilots. Later the Artillery Co-operation School came into residence as a detached flight from Lydd. 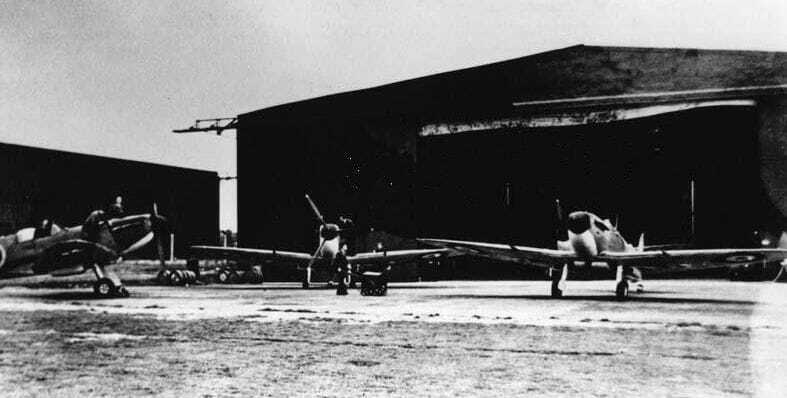 ​At the time aircraft located at the airfield consisted of 20 AW FK8s 12 Bristol F2Bs (pictured left) and 50 RE8s. Personnel on-site amounted to some 1,450. With the Armistice coming at this time very little then happened at the airfield. There were plans to build an airfield at nearby Flowerdown for No 1 (T) Wireless School but this did not come to fruition. Although no airfield was built at the site, RAF Flowerdown did come into existence in 1919. Any requirement for flying at Flowerdown was handled by Worthy Down. Incidentally Flowerdown was used throughout World War Two as a listening station which fed information to Bletchley Park and also after the war as GCHQ's Composite Signals Organisation as a large HF listening station, finally closing in the late 1970’s. Awakening from its period a relative quiet, in 1924, 58 Squadron was formed at Worthy Down on April 1st. The initial aircraft were Vickers Vimy with conversion to Vickers Virginia night bombers by the end of the year. I am indebted to Tony Dowland for allowing the use of this picture of a Virginia at Worthy Down. The photo was originally supplied to Tony by ACM Sir Walter Hugh Martin. 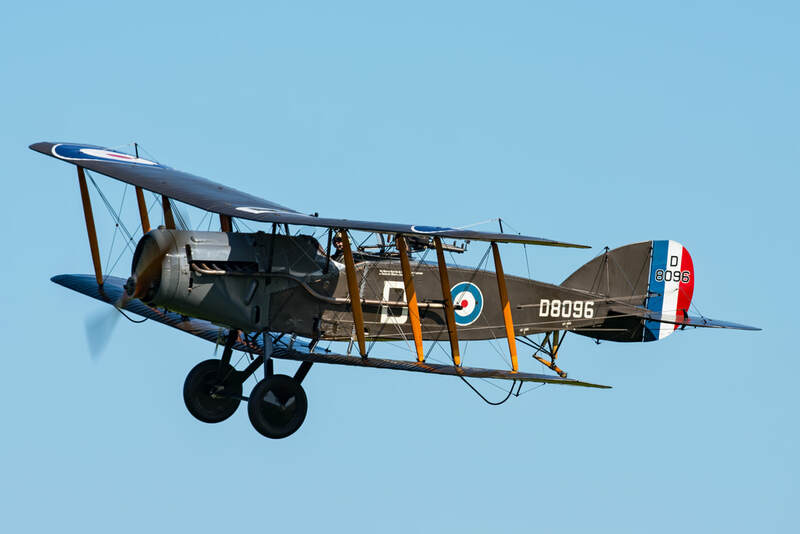 In April 1927, No 7 Squadron arrived from RAF Bircham Newton, again with Vickers Virginia’s. 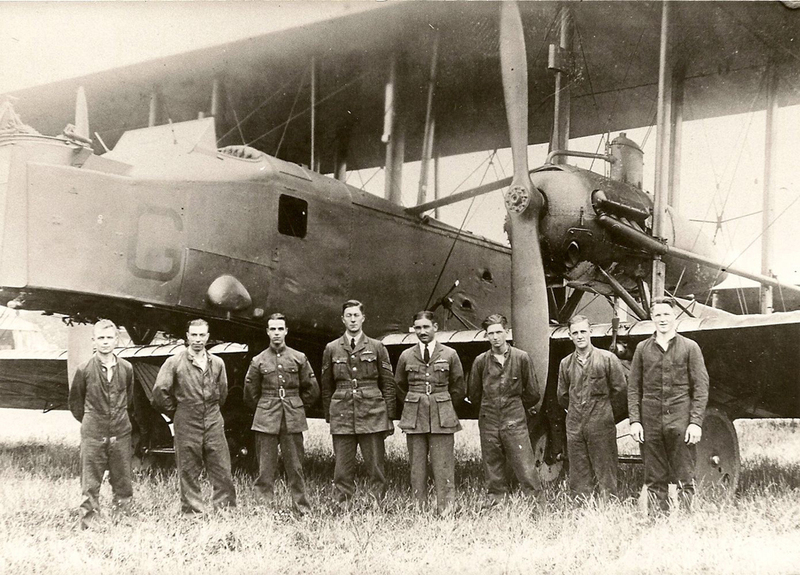 This photograph is of a 7 Squadron Vickers Virginia, again shown at Worthy Down. The shot was taken sometime in the latter part of the 1920's. 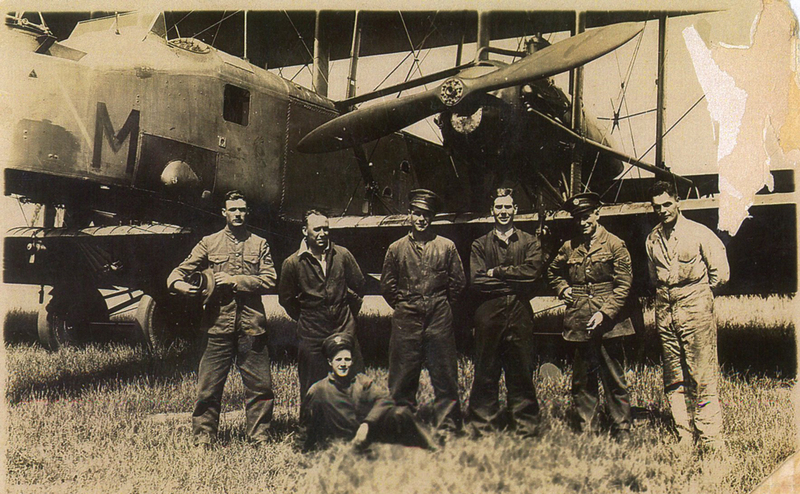 Third from the left is William Weekes who joined the RAF in 1927 as a Fitter - Rigger. The photograph was sent to me by William's son, Tony Weekes. My thanks go to Tony for allowing me to use the image. Up until 1935 either one of the two squadrons held the Lawrence Minot Memorial Bombing Trophy which I suspect led to a fair amount of rivalry between the two units. It is interesting to note that No 7 was commanded by Wing Commander C.F.A Portal who rose to the post of Chief Of Air Staff 1940 - 1945. Sir Arthur T Harris - seen here as Commander in Chief Bomber Command in World War Two. Image Imperial War Museum. ​I have recently obtained a diary entry from someone who lived near the airfield at this time. In this entry the writer states that he/she was being kept awake by the night flying Worthy Down based bombers. Its nice when this type of eye witness account is unearthed so many years later. 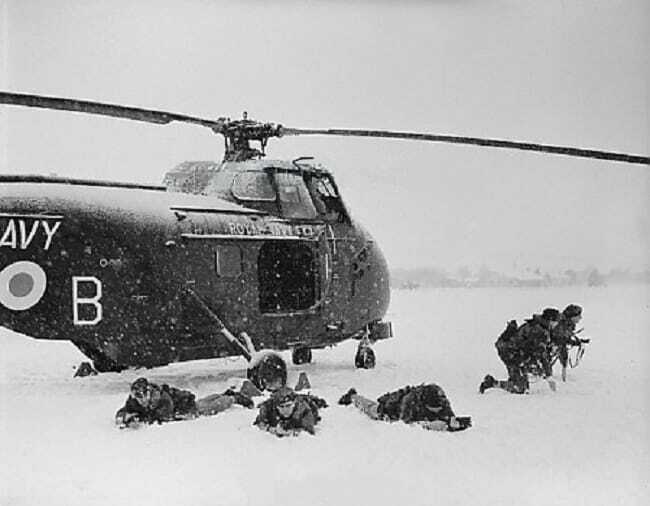 Harris went on to spend nearly two and half years at Worthy Down where is ability as a very able pilot was recognised. He was also known as an outspoken leader and proved to be utterly determined to succeed in the tasks given to him. This stood him in good stead when he went on to lead Bomber Command through those very difficult days of the RAF's night bombing campaign. ​The rivalry between Harris and Portal continued during the war when the pair frequently locked horns over strategy and the bomber campaign. Also at Worthy Down with Harris was Robert Saundby (later Sir) who was one of No 58 Squadron's flight commanders. 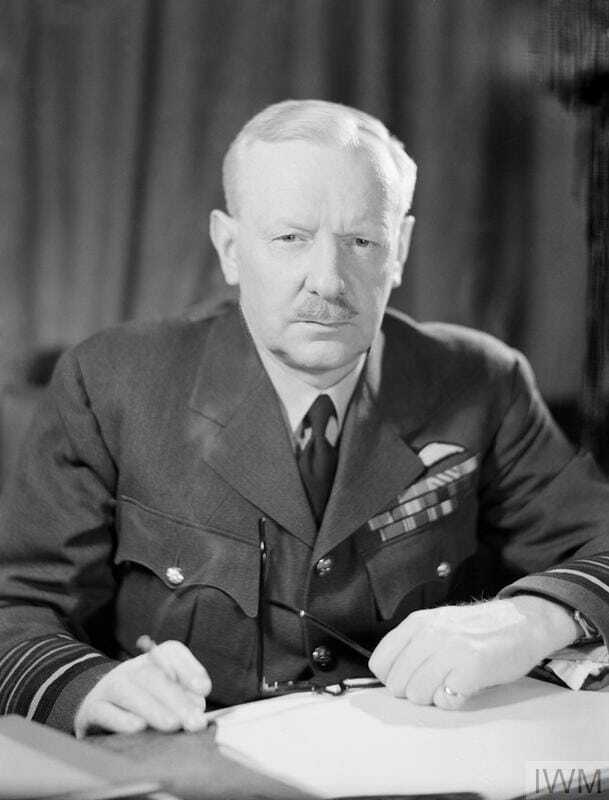 Saundby went on to serve under Harris as Air Officer Commanding Bomber Command during Harris's time as Commander in Chief Bomber Command. 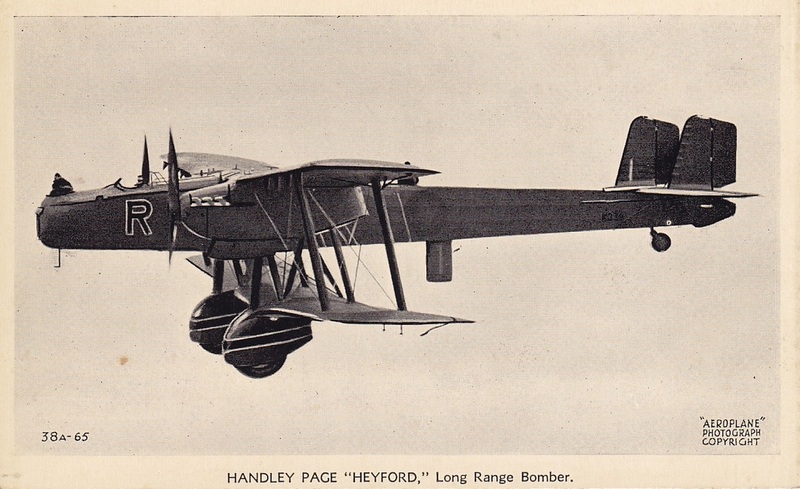 April 1935 saw 7 Squadron begin conversion onto Rolls Royce Kestrel powered Handley Page Heyford II aircraft (similar to the photograph on the left). In August, 2 Squadron arrived with Hawker Audax aircraft to work on Army co-operation flights. Around this time No’s 4 and 13 Squadrons, also with Audax, visited the airfield for a time. B Flight of 7 Squadron in October 1935 formed into 102 Squadron whilst A Flight of 58 became 215 Squadron. The two squadrons initially flew Virginia X aircraft. No’s 58 and 215 left for Upper Heyford in January 1936. In August 1936 Hawker Hinds of 49 Squadron arrived with 7 and 102 Squadrons leaving for Finningley. No’s 35 & 207 Squadrons arrived in August 1936, their Fairey Gordon aircraft having been shipped back from the Sudan rebuilt and test flown at Worthy Down. In August 1937 the Gordon units re-equipped with Vickers Wellesley aircraft. This brought a more complex aircraft with retractable undercarriage, variable pitch propeller and an enormous wingspan. On 14 March 1938, 49 Squadron left for RAF Scampton to re-equip with Handley Page Hampden bombers. One of the Squadron's long term pilots Flt Lt Roderick 'Babe' Learoyd, who had served at Worthy Down, went on to win a Victoria Cross, the second for Bomber Command of the war, for a raid on the Dortmund Ems Canal on 12/13 August 1940. ​In April 1938 Worthy Down transferred from Bomber to Coastal Command. The first squadrons to arrive were Avro Ansons of 206 and 233 Squadrons. Further units also moved in including 220 Squadron again with Ansons, Hawker Nimrods, Fairey Swordfish and Hawker Ospreys of 800 Squadron and some trial Gloster Gladiators. Worthy Down was now to be a Fleet Air Arm Shore Base. In November 1938, 803 Squadron formed up with Blackburn Skua aircraft. The TAG School moved to Jersey on 11 March but swiftly returned to Worthy Down as France was overrun by the Germans in May. The British and French armies were pushed back towards the Channel coast which led to the evacuation at Dunkirk. No 806 Squadron deployed from Worthy Down to RNAS Detling on 27 May 1940 to lend their assistance in covering the withdrawal from the beaches, before returning to Worthy Down. 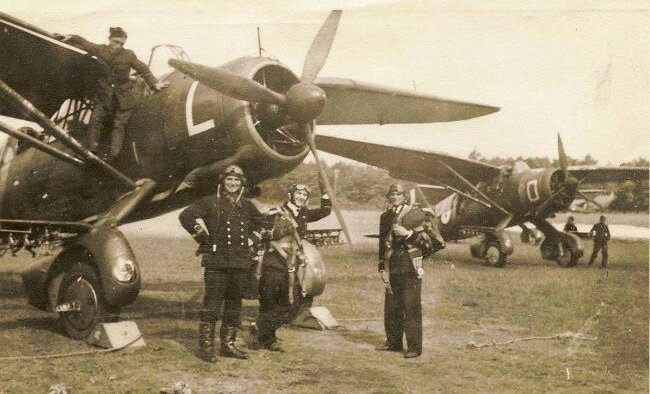 The squadrons pilots collected the first Fairey Fulmar aircraft to enter service from the field and then left for Eastleigh to undergo further training. Fulmars were present when the airfield received the unwanted attentions of the Luftwaffe during the Battle Of Britain. On Thursday August 15th 1940 the airfield was attacked by Junkers Ju 88’s, the raiders were part of LG1 escorted by Bf 110s of ZG2. Despite the constant attention of 43 Squadron Hurricanes, 601 and 609 Spitfires the raiders eventually got through and bombed the airfield though causing very little damage. The cost to the Luftwaffe however was high II/LG1 losing five Ju 88’s to 601 Squadron. In late 1940 Lord Haw Haw made one of his more notorious remarks when he informed the British public that HMS Kestrel had been bombed and sunk. No doubt this caused some amusement to the station personnel. Not so lucky was the Supermarine Factory at Woolston, on Tuesday 24th September 1940 the Luftwaffe attacked the factory killing many of the workers but not destroying the complex. On Thursday 26th September 1940 the Luftwaffe again attacked and caused more serious damage to Spitfire production at the factory, following this urgent dispersal of Spitfire production became a priority and was subsequently arranged. Two Bellman Hangars became available at Worthy Down and in December 1940, Spitfire development flying was moved to the airfield with Jeffrey Quill, chief test pilot for Vickers Supermarine, in charge. In early 1941 a large dispersed storage facility was created across the former A34 road to the west of the airfield. This was accessed by a taxiway and contained 48 Dutch Barn, 2 Bessoneaux and a Fromson Blister hangar. To protect the site a decoy airfield was laid out at Micheldever, three miles to the north east. TAG School activity continued with a number of changes taking place among the squadrons. No 756 Squadron had been absorbed into 755 Squadron by August 1939, on 6 March 1941 756 reformed in its own right as an advanced section of the TAG School. The squadron flew Percival Proctor aircraft but was again absorbed by 755 on 1 December 1942. By July 1941 a shortage of spares for 755 Squadron's elderly Shark aircraft was becoming apparent, to overcome this a number of Westland Lysanders were procured at short notice from the RAF. No 755 Squadron's remaining Sharks were replaced in October 1942 by Curtiss Seamews which proved to be less than successful. No 757 Squadron went into a state of inactivity in August 1939 reforming in March 1941, flying Blackburn Skuas and a pair of Hawker Nimrods. The initial part of the gunnery course was given at Worthy Down before pupils moved to RNAS St Merryn in Cornwall for live firing training. 757's Skuas were replaced by Lysanders in April 1942 before the Squadron was absorbed by 755 Squadron on 1 December 1942. ​Late in 1941 the first Rolls Royce Griffon powered Spitfire flew from Worthy Down, also, much of the early development work on the Seafire took place at the field. With the activity of Supermarine and the arrival of more Percival Proctors in 1942 for the TAG School the airfield became fairly crowded. Jeffery Quill had a coming together with a Proctor whilst testing a Spitfire. The accident occurred on the ground with the Proctor being written off and the Spitfire badly damaged. When researching for articles such as this tales of human tragedy often come to the fore. I recently discovered a grave in the churchyard in the Hampshire village of Itchen Abbas. 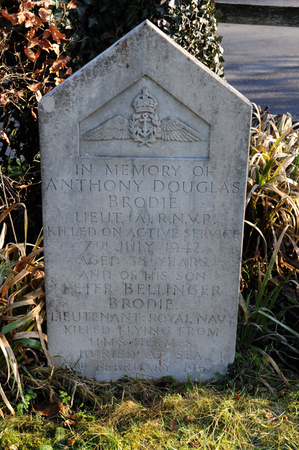 The grave is the final resting place of Lieutenant Anthony Douglas Brodie R.N.V.R. 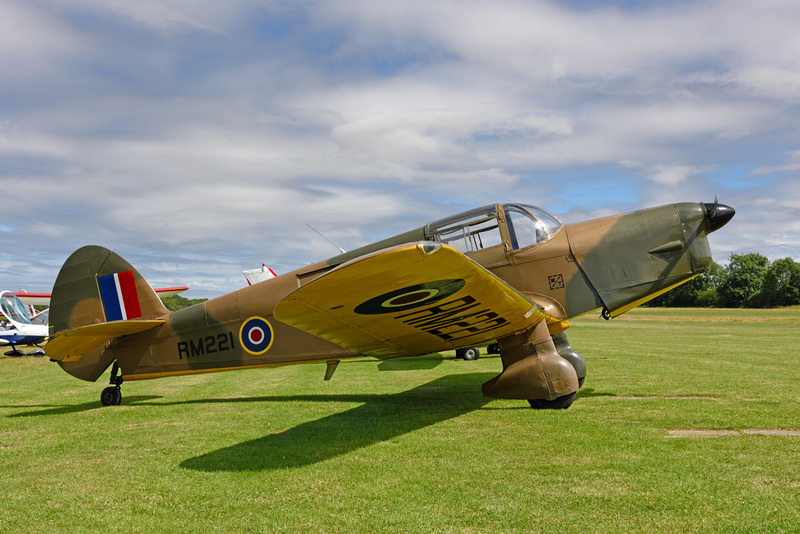 ​Lieutenant Brodie took off from Worthy Down in a Percival Proctor BV591 (similar to the photo left) on 7 July 1942. Near Abingdon the aircraft broke up after part of the wing failed. He along with two others in the aircraft, including a WREN, were killed. It is somewhat poignant to note on the gravestone (left) that Lieutenant Brodie’s son, Peter, was also killed whilst flying from HMS Hermes on 3 January 1967. Peter was Observer in De Havilland Sea Vixen FAW.2 XS588 when a bad approach to the carrier was waved off resulting in a stalled engine. The aircraft crashed into the Mediterranean Sea off Malta which led to the loss of Peter at the age of twenty six. Back to the airfield's history, when the TAG School at Yarmouth in Nova Scotia Canada was established the units at Worthy Down were run down. Nos 756 & 757 Squadrons disbanded whilst 755 continued with the unpopular Curtiss Seamew which they used until April 1944. An airfield in rural Hampshire was not a place you would expect to be touched by the glamour of Hollywood. However, two major players in the world of film and stage flew from Worthy Down during its wartime years. At the beginning of 1940 Lawrence Olivier, by then a very successful Hollywood actor and his wife, Vivien Leigh, returned to the UK with the intention of assisting the war effort. Initially wishing to join the RAF, Olivier was swayed to enlist with the Royal Navy Reserves as his fellow thespian Ralph Richardson was already serving in the Senior Service as a Sub Lieutenant. Both Olivier and Richardson flew with the Fleet Air Arm at Worthy Down as Sub Lieutenants, with neither being classed as particularly gifted pilots. By his own admission Richardson, or "Pranger", as he was nicknamed due to aircraft seeming to fall to pieces under his control, was a timid pilot. Olivier on the other hand was known to to be more reckless and often flouted the rules of the air. There are tales of him flying under bridges, low flypasts and even one of flying inverted with no warning, which left the aircraft's observer hanging on for dear life. Like Richardson several of Oliviers aircraft met untimely ends but this did not deter the actors love of flying and continuing to "assist the war effort". With several years service behind him Olivier came under a different spotlight this time one from Whitehall. Questions were asked as to whether it was better for the war effort that Olivier's natural talent could be used elsewhere. In 1943 the Ministry Of Information asked him to take the lead role in the film Henry V, which he subsequently went on to direct and produce. Following on from Henry V Olivier was asked to help re-establish the Old Vic Theatre; the company's governors approached the Royal Navy and asked if both Olivier and Richardson could be released from service. A very quick response was received from the Navy which led to Olivier stating that the Sea Lords agreed "with a speediness and lack of reluctance which was positively hurtful". Olivier went onto to play Sir Hugh Dowding in the 1968 film Battle Of Britain. Richardson starred in the 1952 David Lean film the Sound Barrier where he played wealthy aircraft factory owner John Ridgefield, some of which was filmed at nearby RAF Chilbolton. ​​He also appeared in the The Battle Of Britain film where Richardson played Sir David Kelly, Britain's Ambassador to Switzerland. Trials of the Mark XIV Spitfire started in November 1943, however as the facilities at High Post improved, Supermarine development flying was transferred from Worthy Down in March 1944. The airfield now became home to some more unusual FAA units. No 739 Squadron (Blind Approach Development Unit) moved in with Oxford aircraft during September 1943. They were joined by 734 Squadron which formed in February 1944 equipping with Armstrong Whitworth Whitley GR VIII’s. The Whitleys were used as flying classrooms to instruct TBR aircrew in the correct engine handling of those converting from bi-planes to Rolls Royce Merlin powered Barracudas. Worthy Down was not an airfield that was ideally suited for use by heavy bombers of the World War Two era with its undulating uneven ground. This however, did not stop two Consolidated B-24H Liberator bombers from the US 8th Air Force making a surprise emergency landing in June 1944. 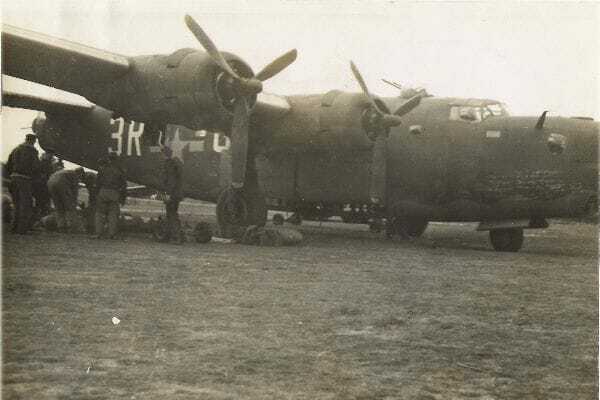 The two bombers 42-52682, 3R:H 'Wild Honey' and 42-52664, 3R:G 'Black Panther' of the 486th Bomb Group based at Station 174 Sudbury, landed at Worthy Down with full bomb loads. ​The photo below right shows 'Black Panther' having its bomb load removed by USAAF personnel. This was presumably to make the aircraft light enough to take off again from the airfield. ​My thanks go to Tony Dowland for allowing the use of the two photos shown below. No 739 left for Donibristle in October 1944 and following this, activity at the airfield slowly wound down. No 700 (Maintenance Test Pilots Training) Squadron reformed in June 1945 but left later in the year, Southampton UAS had two Tiger Moths until October 1946 before they too left and went to Eastleigh. An interesting item appeared on AiX recently regarding Worthy Down and its use as a ground target. This prompted further investigation and I am again indebted to Tony Dowland for providing further information.Circa 1952 Sea Furies from the RNVR carried out mock attacks at the airfield. On Sunday afternoons the air and surrounding countryside was filled with the sound of Bristol Centaurus engines. This annoyed many a local but not Tony who enjoyed the sight and sound of this very iconic aircraft. In the summer of 2011 I paid a visit to Tangmere Aviation Museum and got talking to one of the volunteers. He told me that he was stationed at Worthy Down and was responsible for the bombing range that was there in the 1950’s. He recounted to me that on one day a Westland Wyvern was undertaking attacks on the range. Whilst diving into attack the canopy of the aircraft suddenly became detached and fluttered down to earth luckily without causing damage to any of the near-by houses. HMS Kestrel paid off in July 1952 but reopened shortly after as HMS Aerial II. This was to house the Air Electrical School (AES), no flying took place. However, flying did not entirely cease. In November 1959, 848 NAS re-equipped with Westland Whirlwind HAS.7 helicopters. No 848 left the airfield in March 1960 to join HMS Bulwark. In November 1960 AES moved to Lee On Solent and again Worthy Down was paid off. After this the Royal Army Pay Corps took over the site. In 1992 the Pay Corps amalgamated with the Adjutants General Corps and remains at Worthy Down to this day. 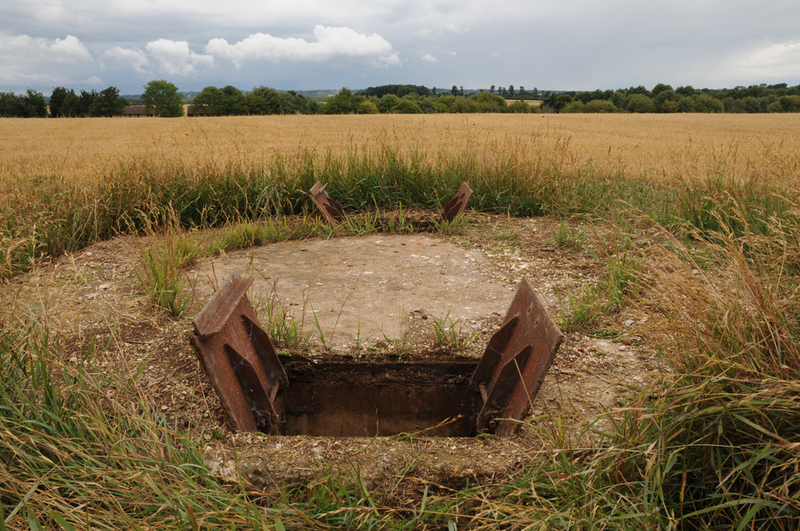 The ground defences at Worthy Down were fairly substantial and consisted a number of pillboxes surrounding the perimeter of the airfield. Today 25 pillboxes remain intact. 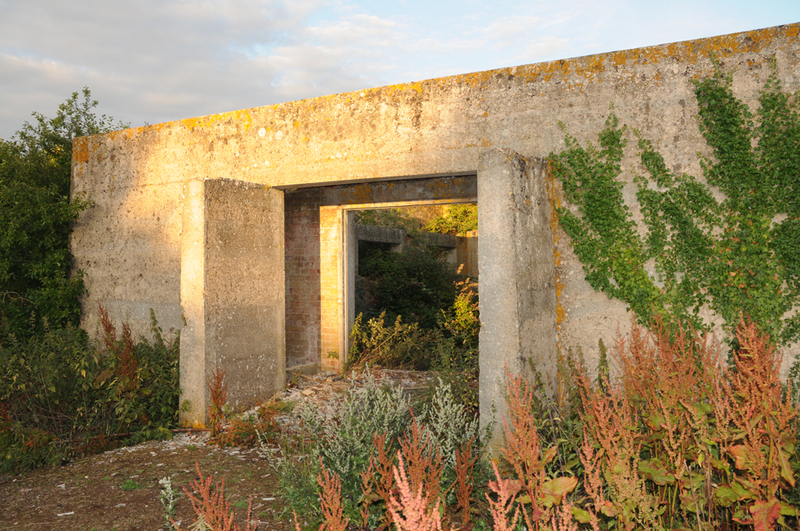 There were three rare counter balance type Picket Hamilton pillboxes located on the landing ground. Two of these survive one being listed by English Heritage due to its rareness and type, but more on that subject later. 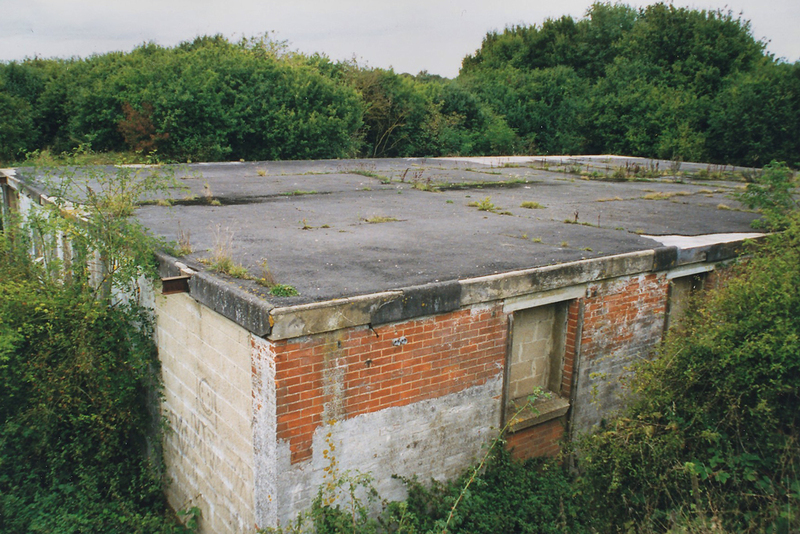 Some of the buildings from the former airfield remain in use today by the resident army unit. I have not personally visited the live site. Outside of the live base there are a fair amount of remains from the former airfield. The landing ground is now turned over to agriculture. The perimeter tracks are used as a recreational facility by residents of nearby South Wonston, where a large housing estate has sprung up over the years.Recently​ it was announced that Worthy Down would benefit from a £270 million development plan. The MOD are investing in the site and creating a tri-service training college. This should see the former airfield maintaining its military links for the foreseeable future. One of the first items that is noted when visiting the site is this Dutch Barn Hangar which has somehow survived for many years. The Dutch Barn was very narrow as it would take naval aircraft with folding wings. This is not the sole surviving hangar though. Hidden away from the public gaze is another rather derelict Dutch Barn. For many years this Torpedo Shed stood at Worthy Down until it was decided under the remit of Health & Safety that it be demolished. Today nothing remains of the Shed bar the access roads. 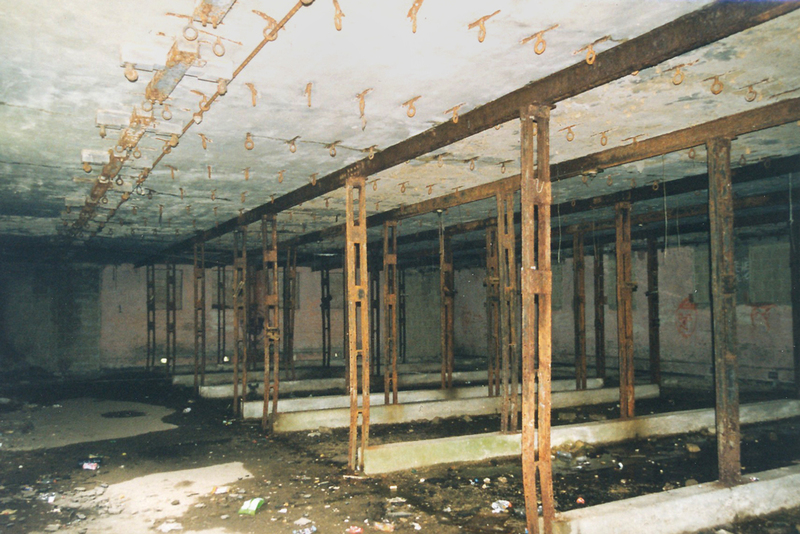 Internal view of the former Torpedo Shed. 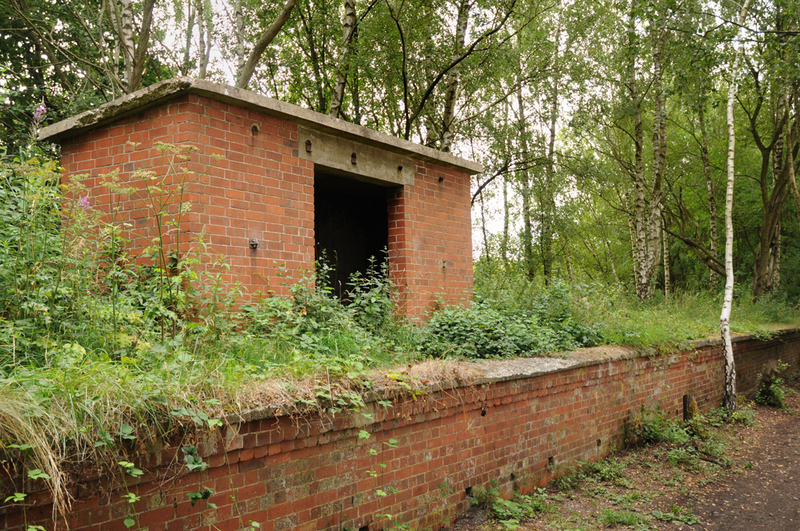 Located near the landing ground is this curious twin walled fuzing shed. The inner structure was built in 1929. At some point after this a further wall was built around the shed to offer additional blast protection. 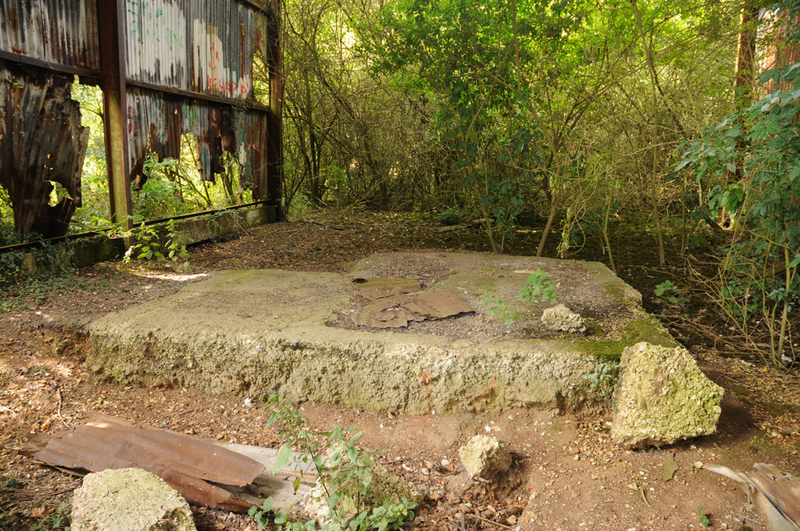 Located out on the landing ground is this rare counterbalance type Pickett Hamilton Pillbox. The box is pretty much complete. I have ventured inside but it is rather wet underfoot. A further PH survives but is not internally accessible at present. If you intend to visit this area of the airfield at anytime it is best to wait until after harvest, least the farmer gets upset. During the build up to D-Day the railway that ran near the camp was upgraded to enable the passage of troops and war materials from the Industrial North. A new platform was constructed and upon it was placed this building which was known as the Admiralty Store. It would appear that the railway was used to transport aero engines as a purpose built crane was constructed next to the line to aid lifting and loading. During the war a leave train ran most nights at the request of the Royal Navy. It became well known due to the antics of drunken sailors returning from a beer up in Winchester. In the end the RN had to put Officers on board the train to keep order. If the sailors left a mess in the train then they had to clear it up. This often meant them returning back to Winchester as the train returned empty stock. A four mile walk then ensued back to Worthy Down which must have acted as a future deterrent to cause trouble. To the east of the camp lies the sewerage disposal works. 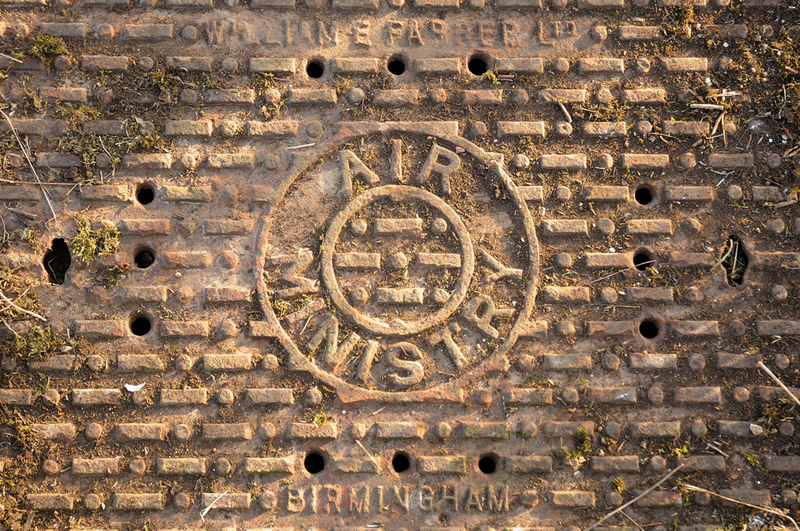 The drainage system serving the works has a number of manholes that are still very evident today. Each of the manholes has one of these cast iron covers in place. All are marked with the Air Ministry stamp which gives a reminder of Worthy Downs past as an active airfield. The sewerage disposal works it self lies in piece of low ground some way past the airfields perimeter. 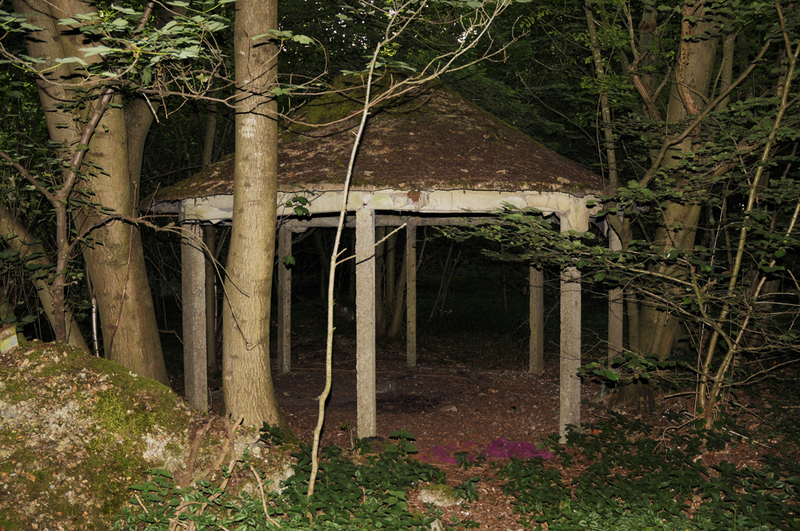 Part of the works may still be seen although it not possible to get to the site as it is on privately owned land. 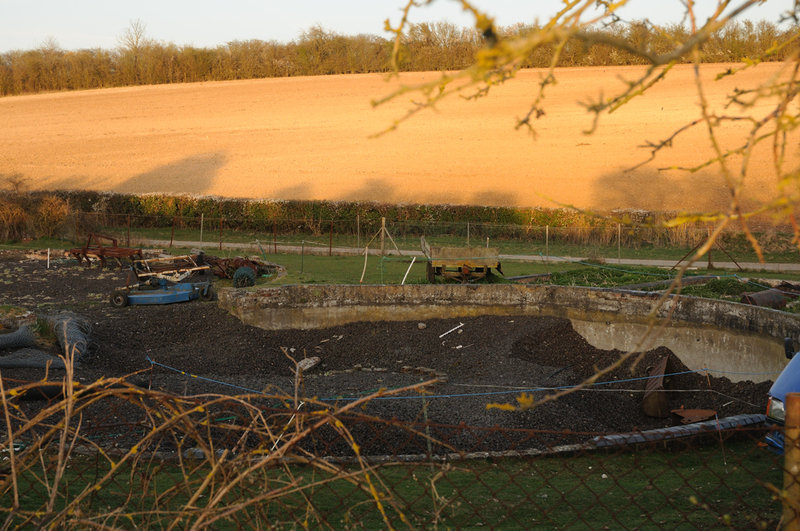 Over the other side of the former A34 road a large aircraft storage area was created. Guard posts were put in place in the form of Quetta Huts. Two of these still survive in situ. 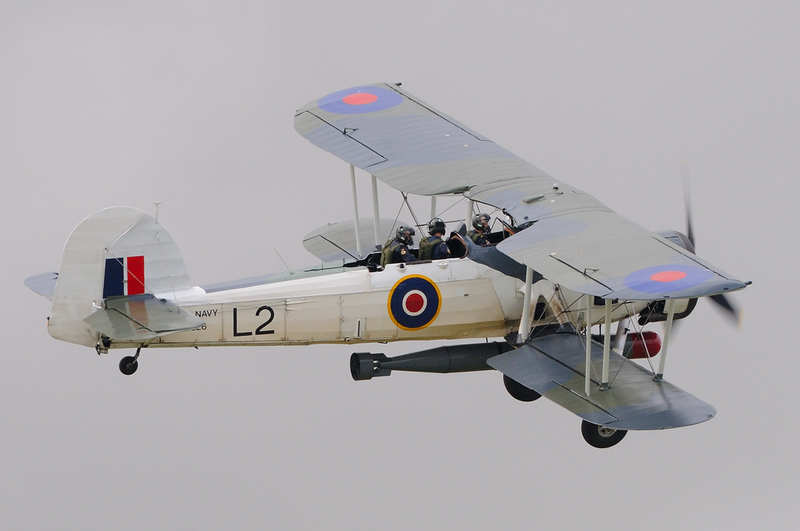 One aircraft that was based at Worthy Down was Fairey Swordfish LS326. 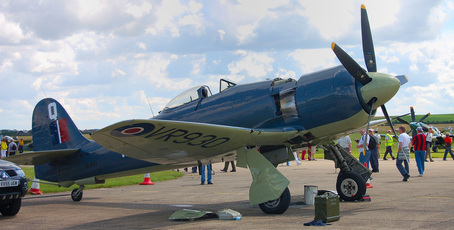 This aircraft was at the airfield after the end of its active service life and was used for training and communication. LS326 now resides at RNAS Yeovilton as part of the Royal Navy Historic Flight. So that concludes the look at the history and the present day Worthy Down. As can be seen there is much that has happened at the airfield which today has quietly gone back to an agricultural existence. I often visit the field and try and visualise the aircraft on approach. I think of Harris who flew from the field and then went onto to become a controversial figure in the RAF due to his strategy of area bombing. I always wish I could hear a Merlin on full song as the engine struggles uphill to lift the Spitfire into her natural element, the air, at Worthy Down. ​I almost got my wish in 2010. With the celebrations surrounding the 70th anniversary of the Battle of Britain a flypast was arranged for the BBMF Lancaster to fly over former airfields used in the battle. The day was set, time was taken off from work. I took my powerful 500mm lens and camera to stand in the middle of the former landing ground. A large crowd of people gathered to witness the event. However, as always the English weather intervened and kept the Lancaster firmly on the ground at Bournemouth. So I never did get to hear the Merlin over Worthy Down and I never got that shot that was likely to me to be a once in a lifetime event. Oh well sometimes such things are best left to the imagination. Walking over the former airfield at Worthy Down a couple of days after Christmas 2016 evoked the usual minds eye image of times gone by. Worthy Down was a flight test site for Spitfires that were delivered from local dispersed construction factories such as Chattis Hill. Spitfires were flight tested at the airfield before onward flight to front line squadrons. As I looked down the former approach in my mind I could see a Spitfire lining up to land from a curved approach possibly with Jeffrey Quill at the controls, as he was once a test pilot here. I decided to recreate that image to show what was once reality and it is shown below.